When you press the help button on the medical alert system, a wireless signal is sent to your medical alarm base station. This signal opens a toll-free two-way communication with a dispatcher. All dispatchers are medically trained professionals available to assist you 24 hours a day, seven days a week. Our dispatchers are trained to help in the event of an emergency, injury, illness, accident, fire, burglary or any other instances where assistance may be needed. A medical alert system may seem complex, but it is actually quite simple. There are three basic components: the medical alarm base station, the medical alarm pendant, and the monitoring center. Our medical alert systems have one of the widest two-way voice ranges available on the market today. Depending on your home's construction, some distances may vary and it's best to test your unit once installed. All medical alert pendants are waterproof. This feature is important for seniors, who may need to wear it at all times, including the tub and shower. The pendant is comfortable and discreet compared to some other wearable models. There are many different types of medical alert system base stations and each has a unique appearance. The Traditional Home system connects to your existing phone line. The Cellular Home and the Mobile GPS systems use the AT&T cellular network and do not require a landline. When activated, the base station will dial the programmed number of the monitoring center. Once connected to the monitoring center, the base station becomes a high powered speaker phone. 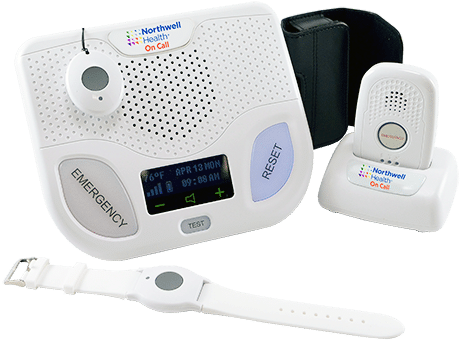 The built in speaker and voice module allow your loved one to have two-way voice communication with a medically trained dispatcher, even if they are not near their telephone.